IRS Installment Agreements - The Best Tax Relief Solution? The stress of delinquent IRS tax debt can be overwhelming at times. While it’s tempting to run and hide, the best way to get collectors off your back is to pay tax debt in a timely fashion. But what about when you can’t realistically settle the debt with a single lump sum? In these situations, an installment agreement may be just what the doctor ordered. The IRS, for all the negative press it gets and the common perception that it’s a greedy, compassion less institution, is sympathetic in certain situations. The IRS wants its money and is willing to work with you to get the amount in full. Because they understand some people cannot pay the full amount with one stroke of the pen, they offer “installment agreements”. Installment agreements are specific arrangements in which taxpayers can pay liabilities over a period of time. This spreads payments out and reduces the financial burden of having to produce large sums of money in a short period of time. 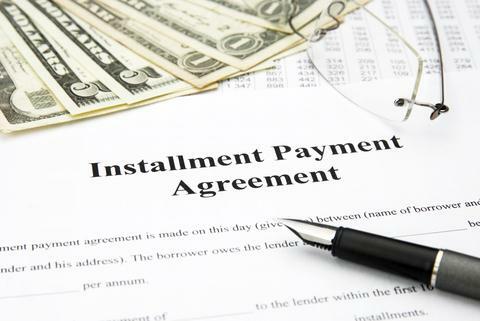 The challenging part for many individuals is not actually applying for an installment agreement, but choosing which installment agreement to pursue. The IRS offers four different options, including guaranteed, streamlined, partial payment, and non-streamlined. Over the past five years, you haven’t filed or paid late. All of your tax returns are appropriately filed. You haven’t applied for an installment agreement in the past five years. Your monthly installment payments will settle your debt balance in three years or less. You are willing to sign an agreement stating you will file and pay on time in future tax years. A guaranteed installment agreement is most often preferred for delinquent taxpayers. The biggest benefit is that the IRS cannot file a federal tax lien. Your minimum monthly payment will be the total amount owed (including all penalties and interest) divided by the number of months the IRS agrees upon for the installment plan. For example, if you owe $8,000 and the IRS tells you to repay it within 30 months your minimum monthly payment would be $266.66. If you don’t meet the criteria for a guaranteed installment agreement, a streamlined installment agreement is the next best thing. In this case, you must owe a balance of $25,000 or less and agree to pay it off within 60 months. Additionally, if your balance is set to expire under the 10 year statute of limitations, the IRS can require full payment within the time leading up to this deadline. As of March 7, 2012, the IRS agreed to extend installment agreement plans to those owing $50,000 or less and willing to pay off the balance within 72 months. This is part of the IRS’s “Fresh Start Initiative” and is a welcome expansion for many laden with tax debt. Again, the major benefit here is that the IRS will not file a federal tax lien, which will be reported to the credit bureaus. The most flexible option – though it permits the IRS to file a federal tax lien – may be a partial payment installment agreement. Under this type of repayment plan, the minimum monthly payment is calculated based on how much you can afford. It also permits longer repayment terms that extend beyond 72 months. However, unlike other plans, the IRS is allowed to regularly re-evaluate the terms and increase monthly minimums based on your ability to pay more. If none of the pre-established plans work in your situation, a non-streamlined installment agreement may need to be negotiated. In this situation, you will be required to directly negotiate terms with an IRS agent. You will be asked to provide a financial statement for review, among other requirements. Additionally, the IRS can legally ask you to take out a bank loan, home equity loan, or sell non-essential assets. Delinquent IRS tax debt is difficult to deal with. Whether you believe you will qualify for a guaranteed installment agreement or need help negotiating a non-streamlined plan, it’s important to get professional help. These situations can be tricky and often require expert help. When you use a tax professional, they can legally speak on your behalf and help you decide the best course of action.